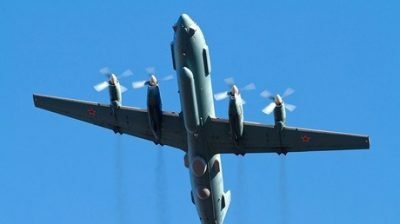 The Syrian defence system shot down by mistake a Russian Ilyushin IL-20M 90924 surveillance plane in Syria with 15 servicemen on board on Monday evening, the day after an Israeli F-16 destroyed an Iranian military cargo plane on the Damascus airport runway killing the second pilot. Simultaneously with the downing of the Russian plane, four Israeli F-16s attacked Syrian and Iranian military targets around the northern city of Latakia. The Syrian air defence system responded against the incoming missiles and hit the Russian plane while in landing position over the Hamymeen military airport. This took place only hours after the signing of a deal between presidents Vladimir Putin and Recep Tayyip Erdogan to halt the battle of Idlib and defuse the possibility of seeing Syrian army barracks and military airports destroyed. Who is pushing for a wider war and why are Russia and Iran refraining from responding to the many provocations in Syria? War drums sounded loudly over the Levant the last few months after Syria and its allies, mainly Russia, liberated the south of the country and directed all military resources towards the northern city of Idlib. This city is under Turkish control but hosts fewer than 2 million inhabitants, of whom tens of thousands are jihadists and heavily armed Turkish proxies. The US and Europe voiced their will to bomb Syria “if chemical bombs are used against the city”. That was a clear invitation for specialised groups in Idlib to stage an attack and give an excuse for US-EU forces to unleash their firepower and destroy the Syrian army’s air power and airports. That is indeed the key to the Russian/Syrian/Iranian lack of reaction to Israel’s many provocations and to the Russian-Turkish deal to suspend the war in Idlib. “Russia was seriously concerned about the US and European intention to destroy the Syrian army in the event of a staged chemical attack. The US had managed to gather behind it a coalition including Britain, France and Germany to bomb Syria, making it very difficult for Russia to react militarily. Putin is aware of US intentions and is not in Syria to start WWIII but to stop the war. But it goes against US interests to see Syria recovering and Russia expanding its control in the Middle East”. The Turkish-Russian deal to postpone the battle of Idlib, blessed by the central government in Damascus and arrived at following several Iranian mediations, aims to keep Ankara close to the Moscow-Tehran-Damascus line and to prevent a wider war in Syria. As an example, it took the Syrian army three years to prepare and equip the Shuay’rat military airport and three minutes for the US to put it out of commission for another 3 years. Russia, Syria and Iran would like to avoid any further burden on Syria’s economy and capabilities. Moreover, a weak Syrian Army would give more incentives for over 60,000 – 70,000 jihadists and rebels in Idlib and environs to break siege and move towards Aleppo, widening the war and creating more opportunities for the enemies of Syrian unity to regain strength. Damascus is happy to calm down the war atmosphere and to give more time for Ankara either to disarm the jihadists, to attack them, or to merge many of them with its proxies. The Syrian government benefits from the deal, if it is respected, by seeing all heavy weapons confiscated by Turkey, as stipulated by the deal, greatly reducing the military capability of jihadists and rebels. Moreover, what was not announced officially is Turkey’s guarantee that no chemical attack will be staged in Idlib to “provoke” the long-heralded US-EU bombing of Syria. On Sunday evening Israel fired missiles against an Iranian cargo plane on the Damascus airport runway. The Israeli missiles didn’t aim directly at the plane and hit next to it. But they were close enough to torch the plane and kill the assistant pilot. This was an unprecedented by Israel, the first of its kind against such a target in the 7 year war in Syria. According to decision makers in Syria, the Israelis had asked Russia to “prevent the flow of weapons from Iran to Hezbollah and Syria”. Moscow answered Tel Aviv: this struggle is not part of its business and it is not ready to police the movement of weapons from Iran to its allies. Idem, when Iran asked Russia to force on Israel the cessation of attacks in Syria against its allies and its forces, Moscow gave the same answer: “we are not ready to take part in your struggle with Israel”. But after the Iranian defence minister promised to supply Syria (Russia refrained from delivering the S-300) with anti-air missiles, capable of endangering the Israeli jets over Syria and Lebanon, Israel decided to move a step forward. This is why Israel decided to bomb any cargo that might improve Syrian capabilities and any weapons factories in Syria developing precision missiles. Nevertheless, according to sources in Syria, Iran has imported enough technology and missiles to its allies so that Israeli jets are not able to damage Syrian missile capabilities nor those of Hezbollah in Lebanon. “Even if Iran loses 15 cargo planes in Syria, this won’t stop it from providing the necessary help to its allies”, said the source. A few hours after the Russian-Turkish Idlib deal, Israeli jets fired against a military facility working on developing Syrian military capabilities. Four missiles hit the target and others were intercepted by the Syrian defence system. Nevertheless, a Russian Surveillance plane was also hit by a Syrian missile while manoeuvring for landing 27 km from Banias (where the debris were found). “Russia has paid a heavy price for its unwillingness to exploit its superpower position in Syria, and for its failure to prevent any external force (US, EU or Israel) from bombing its allies in a theatre under its own control and dominance. In order to protect a perimeter where its forces were deployed, the US attacked and killed hundreds of Syrians in the al Tharda mountains under Obama, and hundreds more in Deir-Ezzour and al-Badiya. By contrast Israeli missiles flew over the Hmaymeen Russian-Syrian airport and the US Tomahawks which hit the Shuay’rat airport travelled over the heads of Russian forces”, said the source which is part of the Russian command in Syria. The downing of the Russian plane is expected to impose on Israel full coordination and approval for its flights over Syria hours before the strike, in order for Russia to maintain its neutral position. This will also give Syria and its allies the possibility to await Israeli missiles and jets and remove sensitive weapons to limit damage. Moscow has paid a certain price but Israel has lost advantage, which is to the benefit of Russia’s allies. The Israeli promenade over Syria may not end there, because Israel has never been restricted in “defending its national security”, as Tel Aviv always says to justify any act of war or aggression against another state or group. Israel’s violations of Syrian airspace may not cease completely but will slow down for a few days, enough to allow Iran and allies to rebuild any capability destroyed. Iran, Russia and Syria did not stop the battle of Idlib – to avoid a war – in order to be trapped in a new war triggered by Israel or the US. This is what prevents Russia, Iran and Syria from giving the US, Israel and Europe any pretext for triggering a war, at the cost of looking weak in front of the world. These very risky decisions are made to allow Syria to stand on its feet again. They are essential to thwarting warmongers in the US establishment. And they are necessary if the economies of the three countries are to flourish rather than wasting all their resources on a useless war with Syria as its platform.